TORONTO , Jan. 14, 2019 /CNW/ - Anaconda Mining Inc. ("Anaconda" or the "Company") (ANX.TO) (ANXGF) is pleased to announce additional results from the 10,000-metre drill program that began in July 2018 at the Goldboro Gold Project in Nova Scotia ("Goldboro"). Fifteen drill holes (BR-18-50 to 63 and BR-18-43), totaling 4,866 metres (the "WG Drill Program"), successfully infilled the West Goldbrook Gold System ("WG Gold System") over 400 metres of existing strike length and extended the WG Gold System 200 metres to a depth of 450 metres, encountering 23 occurrences of visible gold and mineralization characteristic of the Goldboro Gold Deposit (Exhibit A, B, C and D). The infill portion of the WG Drill Program intersected mineralized zones in areas of known inferred mineral resources and demonstrated continuity of mineralization, providing the requisite geological data to potentially convert those inferred resources to the indicated category (Exhibit A, C and D). Expansion drilling intersected the host fold structure, alteration and mineralization to a depth of 450 metres, demonstrating that the deposit continues below the previously modeled WG Gold System (Exhibit C and D). 11.15 g/t gold over 1.0 metre (179.0 to 180.0 metres) in hole BR-18-51. A table of selected composited assays from the WG Drilling Program is presented below. "The second major diamond drilling campaign that we have conducted at Goldboro since we acquired the project continues to meet or exceed our expectations. In this portion of our 10,000-metre drill program, we focused on the potential of West Goldbrook and made significant advances in increasing the confidence level in the continuity of the mineralized system and extending it at depth to 450 metres. 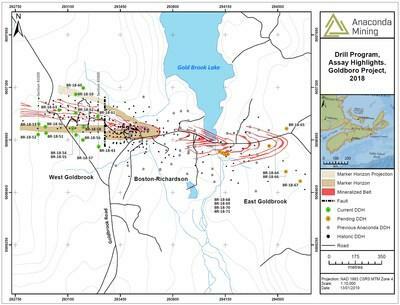 More importantly, we have determined that West Goldbrook is, in fact, the faulted westerly strike continuation of the Boston Richardson Gold System, which has been more thoroughly drilled and contains at least seventeen mineralized zones, approximately double the amount compared to what has been modeled in West Goldbrook to date. Consequently, not only have we been confident of the expansion potential of Boston Richardson and East Goldbrook, but now we see substantial upside in growing the Goldboro Gold Deposit through the discovery of more mineralized zones in West Goldbrook. We completed our 10,000-metre drill program in December and are developing plans for an additional 5,000 metres of drilling in the first half of 2019. Results from these drill programs will be incorporated into an updated Mineral Resource estimate and form the basis of a Goldboro feasibility study to be completed in 2019." 154.5 g/t gold over 0.5 metres (94.7 to 95.2 metres) in hole OSK10-35. Prior to recent drilling, the WG Gold System was defined as the 8 mineralized zones located west of a northerly striking fault that divides the WG Gold System and the Boston Richardson Gold System ("BR Gold System") within the Goldboro Gold Deposit (Exhibit A and D). The BR Gold System is currently comprised of 17 mineralized zones, accounting for 51% of the current Goldboro Mineral Resource, and is consistently located below a unique sandstone bed at least 40 metres thick (the "Marker Horizon"). The recent drilling in the WG Gold System confirmed the working hypothesis that, based on observations from earlier drilling, the WG Gold System is a fault-offset continuation of the BR Gold System. Anaconda intersected the unique Marker Horizon in the hanging wall of the southern limb of the fold structure in the WG Gold System, which means that the western portion of the Goldboro Gold Deposit is the westerly strike continuation of the BR Gold System. Since the BR Gold System has at least seventeen mineralized zones and is open at depth for expansion, then the WG Gold System, which now has 10 known mineralized zones, may also contain additional mineralization at depth that has yet to be discovered below the current level of drilling (Exhibit B and C). Reported mineralized intervals are measured from core lengths. Intervals are estimated to be approximately 75-100% of true widths. Anaconda Mining is a TSX and OTCQX-listed gold mining, development, and exploration company, focused in the prospective Atlantic Canadian jurisdictions of Newfoundland and Nova Scotia . The Company operates the Point Rousse Project located in the Baie Verte Mining District in Newfoundland , comprised of the Stog'er Tight Mine, the Pine Cove open pit mine, the Argyle Mineral Resource, the fully-permitted Pine Cove Mill and tailings facility, and approximately 9,150 hectares of prospective gold-bearing property. Anaconda is also developing the Goldboro Gold Project in Nova Scotia , a high-grade Mineral Resource, subject to a 2018 a preliminary economic assessment which demonstrates a strong project economics. The Company also has a wholly owned exploration company that is solely focused on early stage exploration in Newfoundland and New Brunswick .